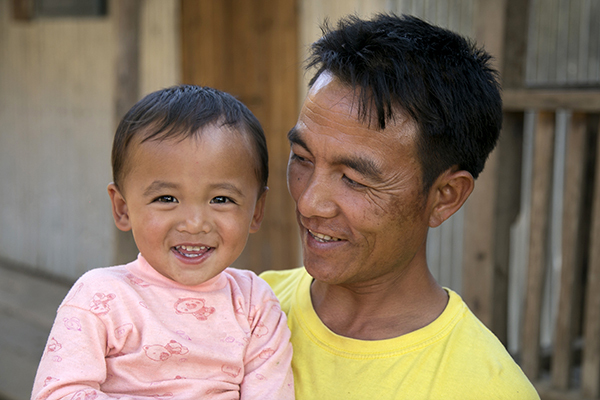 Biak Lian Hre, the elected administrator of Zathlir, a village of 244 people in Myanmar, leads by example. Biak’s enthusiastic support has been critical to the success of a Catholic Relief Services program to improve families’ farming techniques and bring better nutrition to residents. CRS and our local Church partner Karuna Mission for Social Solidarity offer new approaches to plant, cultivate, harvest and store crops, in addition to education on nutrition and cooking techniques. At 41, Biak was considered young for the job of administrator. With only a sixth-grade education, he was dismissed by skeptics as unqualified before the election. After his victory, Biak knew he had to work hard to prove himself in a challenging job. Zathlir is tucked into the mountains far from any large town. Villagers contend with frequent landslides and transportation difficulties. 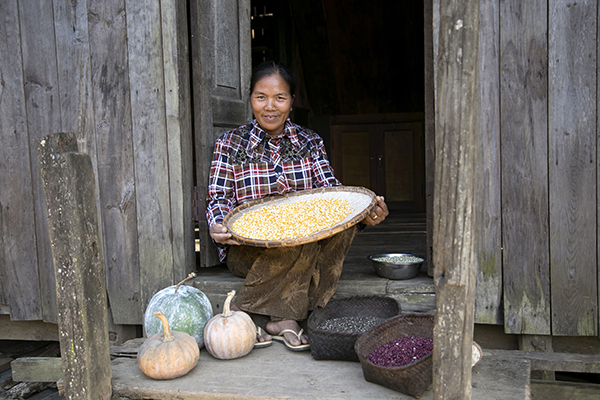 They support their families by growing corn and beans, and sometimes selling pigs they keep in the forest. When a harvest is bad—in a recent year some farmers lost half their corn to heavy wind—it can send people into debt or force them to leave their land. An earlier CRS project, supported by Foods Resource Bank, helped families reduce harvest losses by storing their corn in containers to protect against mold, insects and rats. Biak noted that farmers were excited to learn about this airtight storage. Traditionally, they hung corncobs in the rafters and kept grain and seeds in woven baskets. Although only 30 families in Zathlir formally participated in the CRS project, Biak’s leadership helped ensure that everyone in the village used the containers for at least some of their harvest. Now, grain can last a full year and seeds remain intact for the next planting. CRS is building on this success in Zathlir through a new project, Productive Agriculture through Community Engagement, or PACE. Supported by the Livelihoods and Food Security Trust Fund—its donors include USAID and DFID—PACE will help farmers in selecting and planting seeds, managing pests and preparing more nutritious meals . Biak says he will continue organizing participation in PACE even after his term as village administrator ends. It’s a lot of work for Biak and can be overwhelming, so he relies on his Catholic faith.